Venerable Heng-Ching came all the way from Taiwan to teach the community how to do the rites for varsa, the 3-month monastic retreat. Professor Venerable Heng-Ching Shih earned a Ph.D. in Buddhist Studies at the University of Wisconsin-Madison and taught in the Department of Philosophy, National Taiwan University. She has worked in Buddhist education at almost all levels in Taiwan throughout the years. Venerable Heng-Ching helped establish Pumen Buddhist High School and Fakuang Buddhist Graduate Institute. She also founded the Center of Buddhist Studies at National Taiwan University and Taiwan’s first Graduate Students’ Buddhist Forum. She was also active in the early stages of the project to digitize the Chinese tripitaka, known as CBETA (Chinese Buddhist Electronic Texts Association). 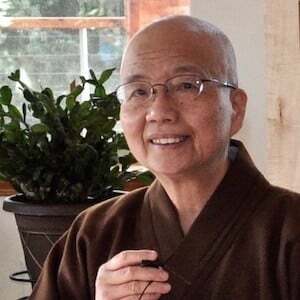 Venerable Heng-Ching has retired and now serves as the President of the Bodhi Education Foundation and as Consultant to the Committee of Western Bhiksunis. She is the author of many academic papers and books, including The Syncretism of Ch’an and Pure Land Buddhism (English), Buddha Nature (Chinese), and Good Women on the Bodhisattva Path (Chinese). She continues to work tirelessly in support of fully ordained nuns worldwide.